Abrasion proof can handle wear and tear without falling apart. Sometimes boot creases around balls of feet. While rough and tough looking, the boot is still very flexible and bends to mimic the movement of a regular sports shoe. The Raider boots are leather and provide firm footing on the ground; it has super traction on slippery floors because of its rubber sole. The Raider boots are leather and provide firm footing on the ground, it has super traction on slippery floors because of its rubber sole. Since these boots are usually leather, they are waterproof up to an extent, meaning they won’t get wet in snow or rain. Its cushioned collar will prevent scraping and discomfort for your ankle and above your ankle. The boot has a slip, oil, and abrasion resistant outsole. It’s engineered for oil sites or wet places. It won’t wear away either, and the sole is abrasion proof. The boots have a thick fitted sole, if you step on something sharp, it will not penetrate your foot, the worst it might do is go half an inch into the shoe, be cautious while around the sharp material. The compression pads on the bottom of the boot absorb shock and return energy. Your feet will not tire of being a force to endure all movement; the boots will absorb the shock. Wave mesh lining in the boot lets your feet breathe. Also, these boots provide comfort for people who need to continuously or often crouch or kneel. 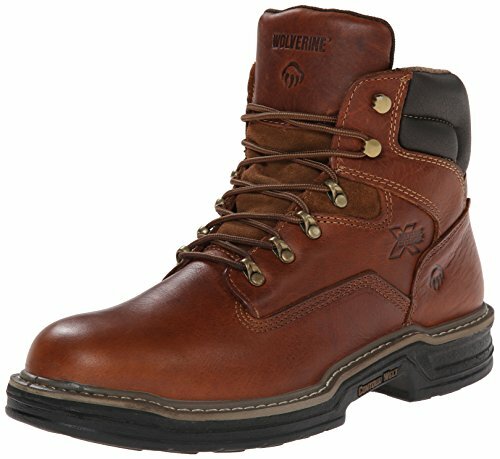 What Type of Professions Would Wolverine Men's W02421 Be Good For? The slip resistance on this boot would be an 8/10 since it is rubber, it should not slide easily and should catch the floor, however, if it is highly viscose with oil or things like oil, the slip resistance won’t be useful. These boots are not for snow or ice. Most likely these boots will have trouble balancing on icy areas. People that live farther north or individuals who are considering purchasing these boots for winter should think otherwise. These boots are made for the rough tread and can keep up with wear and tear of a hard workers’ life. For instance, like a plumber, regular walking kneeling, and bending over will cause discomfort without the right shoes, but with these shoes, you won’t hate having to walk around at your job. If you have diabetes or arthritis, then it Is recommended to insert your custom sole. Once you receive your boots, take out the soles, although they will not hurt you in any way, to provide even more comfort, you want to place your custom-made insoles for your feet if you have arthritis. If you have diabetes, many online products and companies that specialize in footwear or insoles for people with diabetes. Give your due diligence and consult your doctor. If you have wide feet, then you don’t need to worry. These boots can be loosened or tightened around the bottom foot area, a little above the toes so that you can give space for your feet. Also, these boots can be broken into, so your wide feet will break into them, and it will be fine to wear them after the break in period. In between break-in period, however, some users may face difficulty or a feeling that the shoe is too narrow, this is not the case. The shoe has just not adapted to your feet yet. You will want to wear them as much as you can, practice normal movement in them. Wear them to the mall or groceries, if you can, wear them to work.